Scarface Claw is a wonderful animal villain. Honestly, for a close-reading I could have picked any of Lynley Dodd’s Slinky Malinki series (or from the even-better-known Hairy Maclary series set in the same world). I find it impossible to pick a favourite. But if I have a favourite character, it is probably a tie between Slinky Malinki and Scarface Claw. Although I grew up in New Zealand I’m a little too old to have grown up with them. Still, I have collected the entire series and enjoy reading them to my daughter, over and over again. Every New Zealander who has ever read a picture book will be familiar with these animals. Teachers will be able to name all of them. If there’s an archetypal New Zealand picture book series, this is it. For a read-along experience, Penguin has partnered with Kiwa Media and turned some of the Hairy Maclary books into apps. While not created from the ground up for a touch screen, the app versions do offer word highlighting, which can be useful to an emergent reader perhaps. 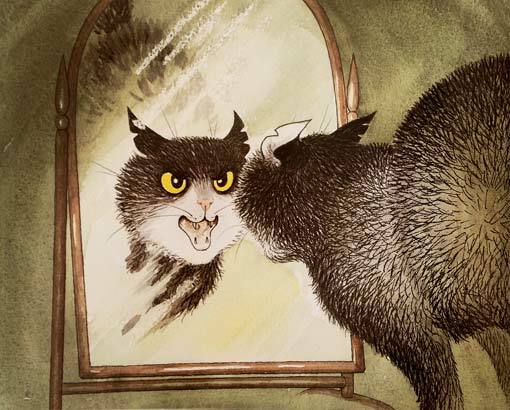 Most readers will already know from previous books that Scarface Claw is ‘the toughest tom in town’, introduced thus in Hairy Maclary from Donaldson’s Dairy. This book focuses specifically on his toughness, presenting a range of scary scenarios that are not the least bit daunting to Scarface Claw. Finally the reader finds out that there is ONE little thing Scarface Claw is scared of **SPOILER ALERT**: Scarface is scared of his own reflection. The most amazing thing about Lynley Dodd’s books how nice they are to read aloud, over and over and over again. Actually, I think the weakest in this regard is the first and most famous Hairy Maclary from Donaldson’s Dairy. I’ll admit I sometimes get ever-so-slightly tired of the repetition of that, which may be as much a comment on how many times I have been called upon to read it aloud. Hairy Maclary is a book which builds on itself, which is excellent for child literacy and speech development and so on, but taxing on an adult reader. For a repetitious book, Hairy Maclary is still excellent. But it is in the subsequent books that Lynley Dodd’s poetic language really shines. To borrow from culinary-world, the mouthfeel is wonderful. It’s all to do with the scansion. The poetry has a distinctive meter, and if you tap the rhythm on the table you’ll see how scary it sounds, sort of like the narrative poems of yore, a la The Highway Man (though this is different again). Something that may pass unnoticed until it is pointed out is that the animals do not talk. There are many picture books about animals, which I would divide into two distinct types: First are the anthropomorphised animals who are human stand-ins. This is of another kind, in which the animals are actual animals, thinking and behaving as humans expect animals might. This requires a good understanding of animal behaviour, and it’s clear Lynley Dodd has a history of living with pets. 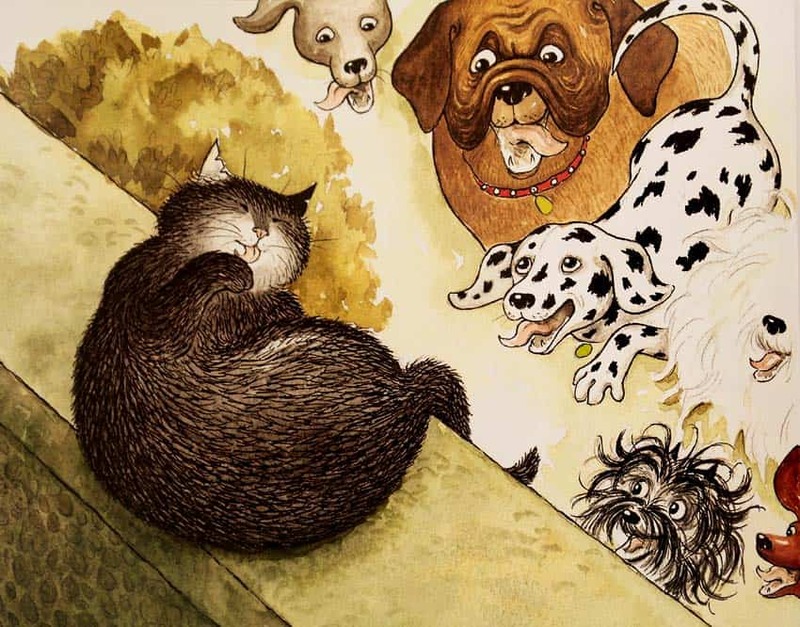 There are two schools of thought when it comes to complexity of vocabulary for young readers, and apparently Lynley Dodd’s work has sometimes been criticised for including words beyond the comprehension of her audience. Another school of thought believes that children should be exposed to vocabulary beyond their comprehension; this is exactly how they learn. I fall into the second camp, and I doubt Dodd would have achieved such perfect rhythm and meter if she had limited herself to words from a children’s dictionary. In the end, does it matter if children don’t know the exact meaning of some words? The illustrations and the language are more than enough to compensate. As with pretty much every picturebook, a lot of the story’s success rests upon the facial expressions of the characters — or animals. Who needs talking animals, when so much language is exchanged in the eyes? In this particular story, even the scary black spiders have big, expressive eyes. As for Scarface Claw himself, this is not a truly scary creature — few creatures really are in picturebooks, which are often read right before bedtime. The young reader is instead encouraged to laugh at Scarface, and also to emphasise with him; children will be familiar with the feeling of being scared of some things and content about others. Here, the contentedness of Scarface is achieved via the closed eyes. Plus, isn’t it always funny to see a cat licking his leg? There’s something graceful and private about it, and when the reader sees Scarface in a more vulnerable moment, empathy is encouraged. The real gem illustration occurs on the penultimate page. After seeing Scarface in a variety of relaxed poses (and scary ones, in previous books) the reader sees for the first time Scarface looking both terrified and adorable. He now has big eyes and flat ears. I accidentally skipped this page when reading to my daughter, who realised a page had been missed. She knew the word that went with it, too. “Where’s the page with EXCEPT…?’ she asked. This was an interesting exercise, borne of nothing more than two pages being stuck together, because I realised just how important this penultimate page was to the story, which could have worked without it, but wasn’t nearly so good. The technique isn’t limited to tails — the reader sees the leg of the oh-so-vital mirror before seeing the mirror itself, a good three pages later. So this technique doesn’t necessarily need to be used on consecutive pages, but can foreshadow well in advance. To go with the ominous rhythm, horror elements have been included judiciously into the illustrations. The picture of Scarface Claw at night outside in a lightning storm features trees with curved, finger-like branches which I have since learnt to associate with Tim Burton. But overall, the book’s scariness is tempered by insertions of comedy. The dogs are supremely comical with their ‘lolloping and leaping’, and their tongues hanging out, with Hairy Maclary grinning like a muppet. This is one of Lynley Dodd’s later books, first published in 2001 by Puffin. Dodd has said that it takes her a year to write and illustrate each book. My softback edition places the colophon at the back of the book. The back side of the front cover very cleverly doubles as both a promotional poster for other books in the series and a checklist of cats which my daughter loves to name before the story begins. As far as she’s concerned, it’s a part of the story. This story leaves a big impression at only 160 words. Scarface Claw may have been inspired (consciously or not) by the American Little Golden Book classic The Large and Growly Bear. Like Scarface Claw, the Large and Growly Bear is an outwardly fierce creature who takes great delight in scaring the creatures around him. The climax is that he is scared of his own reflection in a pond. I expect this plot comes from something even older — probably a folk or fairy tale. I simply haven’t found it yet. Some people are terrified of mirrors, mostly because of superstitions related to reflections and the dead. This fear is called spectrophobia. 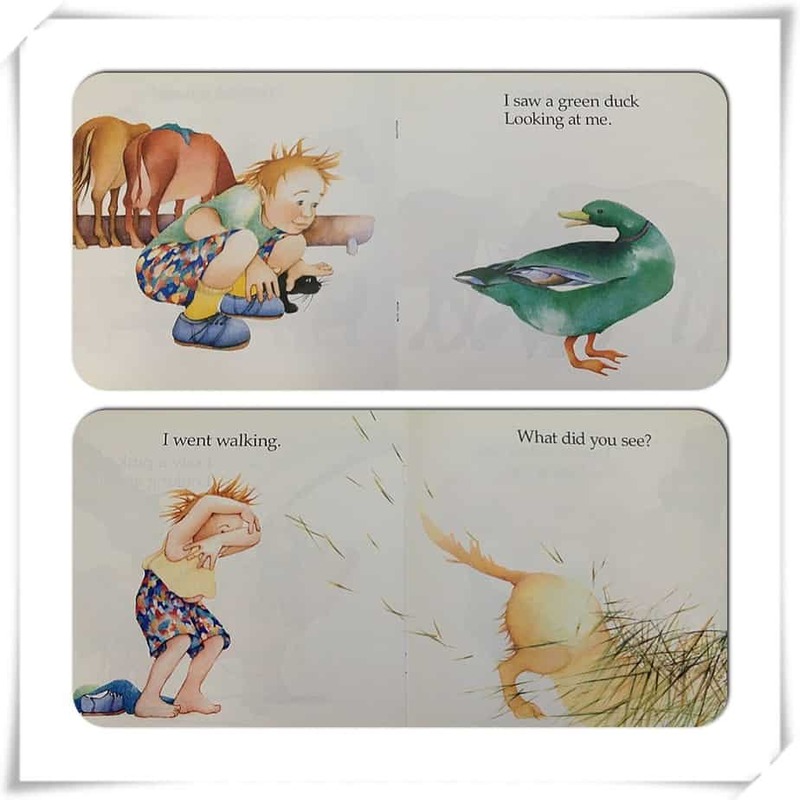 For an example of a picturebook that is written around the technique of ‘tails first then turn the page’ (or whatever it’s actually called) see the Australian classic I Went Walking, which doubles as a book for toddlers as well as an early reader for slightly older children. When a character is scared of something a child doesn’t find scary, this is a sure source of humour for a child, and is utilised by other writers, too. In series one, episode eleven of Lake Campbottom, the character of Gretchen fails to be frightened of all sorts of nasty things, but is then terrified of a cute chipmunk with big eyes.